Today we're pleased to announce MoreGallery 1.6. This release brings some great improvements and new features which I think you'll love. The actions are performed in a single batch so tidying up your gallery just got a lot quicker! If you're a loyal MoreGallery user, you'll also notice some design changes in MoreGallery 1.6. We've redesigned the icons to be more consistent. Now when you hover over an image, the title and filename are replaced with a toolbar. Instead of just icons, it also shows a label to clarify the action. We've also improved the distinction between shown/hidden and selected/hovered images in this release. Finally, MoreGallery 1.6 is now also a great example of the type of accessibility we'd like to promote in more of our extras. MoreGallery is now fully usable with just the keyboard. Just tap alt+g to focus on the first image and use the arrow keys or tab to navigate through the gallery. 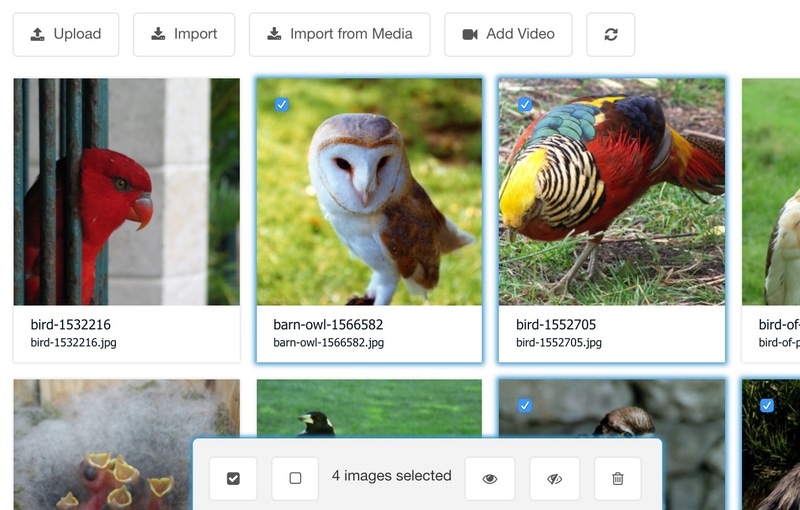 You can select images using space for the new batch feature. Use alt+b to focus on the batch toolbar that allows you to swiftly remove all images without moving your mouse. All shortcuts and keyboard usage tips can be found in the documentation. Those are the most important 3 improvements in MoreGallery 1.6, but of course there's more! The list of tags is now shown immediately when you enter the tags field so you can more easily select tags; it's possible to drag-and-drop images from the file tree into the gallery to import them, and importing videos now works with allow_url_fopen disabled.